When you are newly engaged, one of the most frequently asked questions after you show off your ring is 'Have you set the date?' For many newly engaged couples, setting the date is one of the furthest things from their mind. Some couples decide to have a short engagement and some decide to have a long one. Whatever you decide, there is no wrong or right answer. With an engagement, there comes pressure from family and friends to set a date for a wedding, but the only important thing is that you are happy with what you decide to do. Some like a short engagement as they are ready to make the next big step in commitment, however some may need a little extra time due to other aspects of their lives including finishing a university degree, travelling or saving extra money to buy a house. Whatever the reason may be, there is no need to rush the commitment of marriage. Some couples decide that they want to live together before they set a wedding date. This is common with many young couples, as it is important to determine whether or not they can live together. Then there are couples that decide they would prefer to stay engaged for many years. Some couples find this suits their lifestyle better. Commitment has been made between two people with the exchange of a ring, and marriage can be seen as only a signed piece of paper. 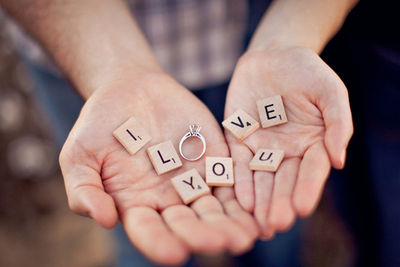 Getting engaged is a commitment in itself, showing one another that they are devoted to each other. Love should not have to be shown through a lavish wedding, instead a commitment of vows should be made when the couple are ready to make that promise. Some just like being engaged.